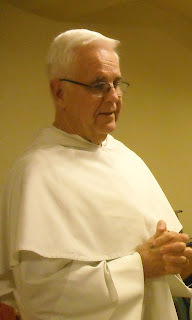 A recent event in our monastery was a fraternal visit with our friend of many years, Father Ed Ruane, OP. Father has been serving as Vicar of the Master of the Order, Fr. Bruno Cadore, OP, for the last six years. In this capacity he lived in Rome at the convent of Santa Sabina. At the same time he served as Socius to the Master for the North American Provinces. Now, having finished his term, he is returning to the United States and will take up new duties as pastor of St. Dominic's Church in Denver. Father has been a devoted friend and brother of our monastery for over 20 years, and also served two terms as our Vicar. He has developed a deep friendship with our community and each time he visits his sister who lives close by, he includes a day with us. We look forward to these occasions and enjoy his company. These words are recorded in the book of Jeremiah chapter one verse three. BEFORE — How far back in your life can you remember? Does your conscious memory extend to the age of five? To the age of three? I was aware of you much earlier than that. you were already a potential being in My mind and heart. I — Your Creator is the very same that planned and drew into existence the mighty galaxies with suns and worlds whirling around the vast expanse of the universe in such perfect order. The same who devised the means by which various sounds weave together to form music. The gorgeous vistas of oceans, mountains and meadows were formed by the same almighty hand. The humor of a kitten at play and the mighty intellect of an Einstein are products of the identical Divine Wisdom. And ALL of that expertise was used in forming you. I am the one and only Creator of heaven and earth – and of you. FORMED — Yes, I formed you cell by cell, bone by bone. I fashioned, molded, developed, gifted you. the temperament you would have. I picked out the talents and gifts I would bestow on you, and wove all of them into your personality, with the utmost care. Your special relationship with Me. I watched you grow day by day, and eagerly looked forward to the blossoming of your full potential. YOU — This was not a THING I was putting together. Of course I had formed many others in the course of the centuries, some of whom would become more famous and important to the world than you. And many who would not be known by even as many as you will reach. But you are special to Me. nor will I ever make another exactly like you. You are the only one who can give Me glory in the precise way that is possible for you. This is one of the reasons why you are so very precious to Me. IN THE WOMB — All this forming and shaping and fashioning took place in your mother’s womb – in darkness and seclusion. Most real growth in life does take place in secret. I’m not finished with you yet. Your formation will continue until your last breath. As long as there is life there is change and growth. I KNEW YOU — I knew you through and through. held you close in my mind and heart. I arranged all the surrounding details of your family, friends, work, country, home, hardships, and breaks in life. Each one has its place in your formation for eternity. YOU — I knew YOU. But right now we’re talking about YOU. I knew you then and I know you now. and hope that others will take you to be. But I also know the real you behind that mask. I know the person that is being shaped by all of that. and love Me more and more deeply. We recently had a delightful visit with the Novice Brothers of the Western Dominican Province. 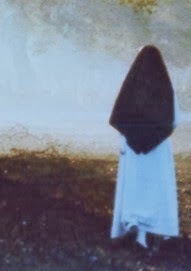 Each year the Novice Master, Fr. Anthony Rosevear, OP, brings the new group of novices to visit with the nuns. We begin with singing the Office of Mid-Day Prayer together in the chapel, and this is followed by the recitation of the Rosary with one of the Brothers leading. Then they go to the visitor’s dining room for the lunch we have prepared for them, while we have our meal in the monastery refectory. After lunch the two groups come together in the parlor where we enjoy hearing about their experience of life in the novitiate and their plans for the Province tour which begins right after the March for Life. The novices and the nuns relate their vocation stories and we are all inspired and edified by the way grace has worked in the life of each one. Many and varied paths lead to religious life and each one is a wonderful gift of God. At the end of our visit each novice is given a prayer partner from the monastery. The nuns follow in spirit the young Dominicans on their journey in the footsteps of St. Dominic. The Feast of the Baptism this Sunday is the final note of our beautiful Christmas Season. Today we celebrate the day when Jesus began His public ministry by presenting Himself to John for Baptism in the Jordan River. 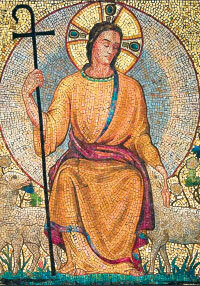 It was on that occasion that a dove descended upon Him and He heard the voice from Heaven, “This is My Beloved Son in whom I am well pleased.” His true identity was thus revealed and others began to follow Him, absorb His teachings and would later take these teachings to all peoples far and wide. This liturgical celebration gives us an opportunity to reflect on our own Baptism. It was then that we were given the mission to spread to all men and women the astonishing truths that God has come in the flesh in the tiny village of Bethlehem, Jesus took all our sins on His own shoulders, died and rose again, and is now interceding for each of us at the right hand of the Father. One way of exercising this ministry entrusted to us at Baptism is to support and encourage vocations to the priesthood and religious life. We could each invite a young man or woman to consider if the Lord is inviting them to His service. Very often a personal suggestion is the catalyst which starts a young person on a path of serious discernment about the Lord’s plan for their life. Some people are able to help those who are prevented from entering a seminary or novitiate by a student loan. This can be done through the Laboure Society or the Mater Ecclesiae Fund for Vocations, either of which can be found on the web. And we can all pray for vocations, that the Lord of the harvest will send laborers into his field. Father, we are your people, the work of your hands. So precious are we in your sight that you sent your Son, Jesus. Jesus calls us to heal the broken-hearted, to dry the tears of those who mourn, to give hope to those who despair, and to rejoice in your steadfast love. 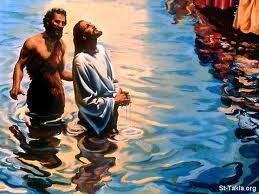 We, the baptized, realize our call to serve. Help us to know how. Call forth from among us priests, sisters, brothers and lay ministers. With our hearts you continue to love your people. We ask this through our Lord Jesus Christ, your Son, who lives and reigns with you and the Holy Spirit, one God forever and ever. The Feast of the Epiphany is an example of the wonderful things our “God of Surprises” often does for us. In their wildest dreams, nobody would have imagined that the God of the Jewish people, the God of the Old Testament, the God who was so careful that His people were separated from the nations, would reveal Himself to Gentiles at His birth in Bethlehem. And of all ways to make it known, He sent a special star to those who studied the stars in a far distant country. 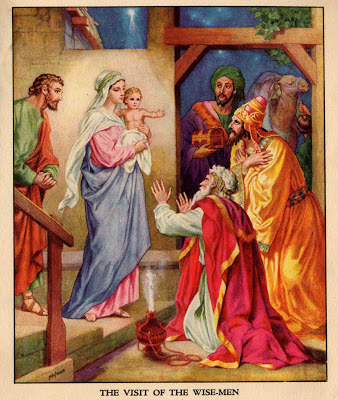 It guided them to the home of the family of Jesus, Mary and Joseph where they found the Child and worshiped Him as God with their gifts of gold, frankincense and myrrh. These men, whom tradition tells us were three in number, probably came from the area around Persia, and were most likely worshipers of Zoroaster. But the fact is that they were open minded and willing to find out the truth even though it cost them much time, money and effort to cross the desert to find this newborn baby. We too are Gentiles. And yet God has shown Himself to us in many ways. Although we cannot see the Godhead with our earthly eyes, we can see His works all around us. And if we look with the eyes of faith, we can see Him in each person we meet. In some He seems to use a pretty good disguise, but with a bit of concentration, we can find the Presence. And we know He is hidden in us too. As we learn more about prayer and holy living, we will become more and more transparent, so that His presence can shine through and make it easier for others to ‘see’ Him. In our monastery we have the tradition of celebrating this day with “King’s Cake” On the morning of the Feast of the Epiphany, each Sister offers her Mass and Communion for the one who is the lucky ‘King’. Before the noon meal, fruit cake is sliced and placed on plates in the kitchen. There are exactly enough plates for the number of Sisters. The Prioress hides a piece of candy under one of the pieces and they are served with the meal. Every Sister takes a piece and, eagerly examines it to see if she has the slice with the hidden candy. The one who finds the candy gets the Masses and Communions of the entire community.